The processing phases of Bresaola della Valtellina PGI must follow precise rules seth forth in the Production Regulations, guaranteeing the product authenticity and the traditional processing standards. Each single phase is monitored and subject to strict inspections to guarantee health-hygiene safety, traceability and quality of the product. The careful selection of raw materials is the basis for a top-quality product. Each single piece of meat is subject to careful selection. 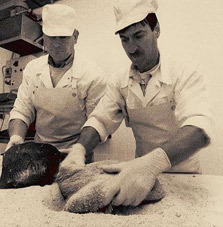 The specialist operator proceeds to assessing the piece of meat prior to trimming it. Trimming requires skill and precision, because the fat and tendons must be removed without carving the muscle pulp. Substandard raw materials are discarded (for example, when the piece is too marbled or has an anomalous colour). The type of salting process used is dry salting: the meat passing the quality check is covered with a moderate quantity of sodium chloride and natural aromas. 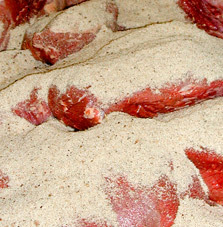 The salt solution is formed with the meat juice. Wine, spices and sugars can be added, to boost the micro biotic phenomena accounting for the ageing of the product. Sodium and/or potassium nitrites and nitrates, ascorbic acid and its sodium salt can also be added. Ancient recipes hold the secret of the expert dosing of aromas, which allows the product to acquire its personality, with flavour nuances that distinguish one producer from the other. Salting cannot last less than 10 days. It is alternated with massaging operations called churning, allowing the homogeneous migration of salt and aromas into the meat pulp. 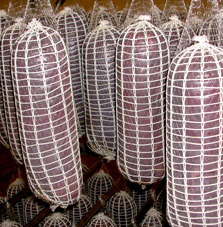 After salting, the meat is packed in natural or artificial casing and sent to the following drying phase in special cells. The drying phase has an average duration of one week and must enable the meat to rapidly dehydrate during the first days of treatment. Drying is followed by ageing, conducted at an average temperature of 12 °C to 18 °C. The ageing phase, including drying, lasts from 4 to 8 weaks. The facilities where ageing and drying take place must be equipped to ensure appropriate ventilation and adequate conditions of temperature and humidity. The Regulations forbid the use of techniques for accelerated dehydration of the product. prodotto. Due to the favourable climate of the typical production area, ventilation and exposure to natural humidity are allowed. The operator’s ability to apply the correct variations is essential at this stage too. 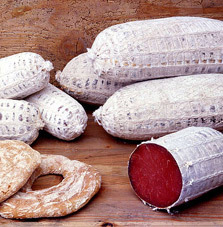 The aged product that passes chemical, sensory and commercial verification as per the Regulations can be sealed with the PGI trademark (clearly readable image of the EU yellow and blue mark).“Bresaola della Valtellina” can be marketed whole, loose or vacuum-packed, in pieces, steaks or slices, in vacuum-packs or modified atmosphere. • The EU-approved PGI mark.